Memories are made of this!!! Located in Deerfield Resort with lots of amenities! Swimming pools, tennis courts, sand volleyball, childrens playground, private airstrip, marinas, Tiki Club, Championship Golf Course, and Carry-out stores. Looking for a nice relaxing weekend playing golf??? Now you can book your Tee Time online with The Greens at Deerfield and your lodging with Deerfield Vacation Rentals. Book now to receive a "Golfer Discount" on your lodging!!! Located on the Golf Course - Great views of Greens at Deerfield and Norris Lake. Lots of deck space to watch the golfers! Rates vary and are subject to change. Reservation is not accepted until process by the rental office. There are no charges to your credit card until rate and unit is approved by our office. Home has lake access but does not have a dock. Rates vary and are subject to change. Reservation is not accepted until process by the rental office. There are no charges to your credit card until rate and unit is approved by our office. Walk out your door to the clear, pristine waters of Norris Lake. All homes come with private dock. Many homes offer covered docks, jet ports. Each are individually owned and reflect what the owner has chosen to give you the best vacation. Many have fireplaces, whirlpool baths, hot tubs, game tables, family rooms, extra refrigerators, huge decks for entertaining. All have fully equipped kitchens, washer and dryer (unless noted) and many other extra amenities. Prices vary during the season and are subject to change. There are no charges to your credit card until rate and unit is approved by our office. 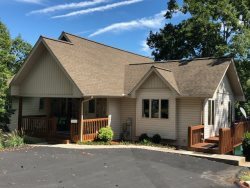 These condos are situated on a high hill overlooking the Greens of Deerfield Championship Bobby Clampett Golf Course and the clear pristine waters of Norris Lake. Close to Deerfield Cove Marina and Tiki Bar. Rates vary and are subject to change. Reservation is not accepted until process by the rental office. There are no charges to your credit card until rate and unit is approved by our office. Homes & condos located on the Golf Course. Great views of lake and course. Not only will you find some of the greatest views of Norris Lake from our lakeview homes, you will enjoy watching the deer frolic right in your own yard. All homes have fully equipped kitchens, washer & dryer as well as many other amenities. Covered boat slips are available for rental at the Deerfield Cove Marina. Rent 6 nights and your 7th night is FREE! Rates vary and are subject to change. Reservation is not accepted until process by the rental office. There are no charges to your credit card until rate and unit is approved by our office.